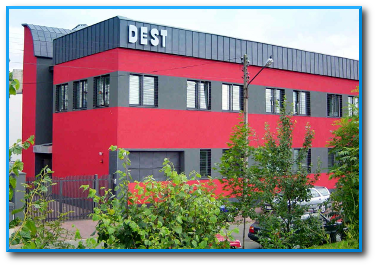 DEST was founded in 1980. We have been dealing with car accessories since the very beginning. It was our firm that produced voltage regulators for Polonez, a legendary Polish car produced from 1978 to 2002. But it was in 1993 that we decided to specialize in anti-theft car alarm systems with our own brand DOG alarms. Our products include many types of interfaces designed for vehicle's comfort features as well as multiple additional functions like central locking system, shutting the windows function, movement sensor or siren function. Initially, our systems operated only at infrared wavelengths, later that changed into radio wavelengths. Wide variety of highly specialized products enabled us to cooperate with many demanding customers like Mercedes, Fiat, Opel, Volkswagen, Audi, Skoda and Chrysler. Fast development of contemporary electronics is an inspiration and an obligation to update our products regularly and to adjust them to the solutions introduced by car constructors. Thanks to the development of microprocessor technology we were able to introduce a new generation of car alarms operating on a dynamic 64 bit code system. In 2001 we produced first unmanned alarms controlled by car signals. First analogue, later CAN Bus alarms. Requirements of the market as well as reality in which cars are often targets of thieves, we have accompanied our systems with specialized functions, an anti-robbery and an anti-abduction function. In 2010 we have introduced DOG 70, a professional CAN alarm system that is reprogrammable according to a vehicle type and adjustable to additional configurations. We also produce regularly updated versions of DOG BLOCK immoblilizer with a keyboard and a Spiid system. In 2005 we have introduced new functions to our alarms - GSM reporting function and SPY-DOG locating function. That year we also began production of SAT-DOG, the first Polish satellite tracking system. One of our latest product is also a satellite, anti-robbery SAT-DOG alarm with central monitoring. For the last five years we have been developing and expanding our GPS system SAT-DOG Fleet dedicated to fleet management. The system offers multiple useful tools that enable more economic and safe management of vehicles with all the functions available on-line. In our company we are committed to providing most efficient solutions for business and transport. That is why a specially designed ECU board computer for the first Polish electric car was invented in our company! Our products have been granted international certificates and Type Approvals.